Can you tell I am a fan of Seitan? What is Seitan? It is a meat substitute used by vegetarians and vegans. It has the texture of meat. Not much flavor on its own, so you add whatever flavor you like. High in protein, a really good, healthy meat substitute. 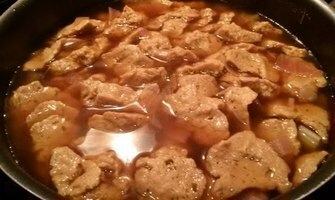 Below you will find a basic Seitan recipe. It is really good, it is to be used for a more firm seitan, to be sliced up or shredded in food processor to use in stir frys, etc... If you are looking for a lighter Seitan, try the Smoked Turkey Roast recipe also on this site, it is more like using a ground turkey sausage in recipes... Either way, this stuff is amazing! Combine and whisk together dry ingredients. In food processor, combine wet ingredients. After both are well stirred combine together. Stir with wood spoon, then use hands and knead for a few minutes. (this is important) If it is too dry add more water. After well blended it should stretch like elastic. (yes, I said elastic) Put back in bowl, cover with damp towel for 5 minutes. In the meantime, heat up 6-8 cups additional veg broth in deep soup pot, chop up 1/2 large onion, and 3 stalks of celery in big pieces and put in with broth. Once it comes to a boil, turn heat down to a simmer. Use your kitchen scissors to cut small pieces off the Seitan roll, and drop in the hot water, simmer for 1 hour, stirring every 15 min. When complete remove seitan from pan and use in whatever recipe you would like that normally calls for meat. Keeps in refrigerator, covered in broth up to 5 days, or you can freeze a batch and use when you like. What I prefer doing with the leftover seitan is leave it submerged in the broth overnight in the refrigerator, remove from broth, pat dry with paper towels, then put in food processor and pulse just a few times to turn it into little "meat" pieces. Then freeze them in a freezer bag, and pull out however many you like to add to your dishes. I find it is great that way mixed in with stews, stir frys, chili's, etc... This makes 8 servings of approx 220 calories.